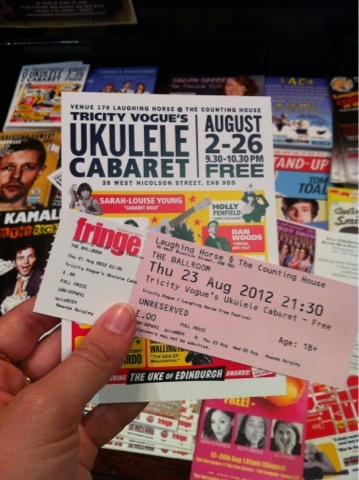 i mentioned one of the reasons i headed over to edinburgh in the first place was to see the fringe festival. while there were actually apparently three festivals on at the time of my arrival, the fringe is an annual festival that attracts tourists from all over with comedy, plays, live music performances, poetry, and basically every other form of performance art you can think of. 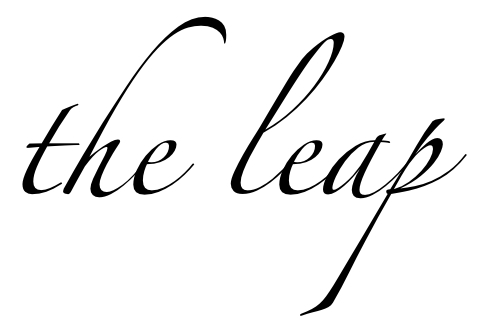 the acts are scattered throughout the week of the festival, with some acts repeating every day at the same time in the same venue. notoriety of each performance varies from david hasselhoff to two old retirees from cork, as does the price if each show you attend. 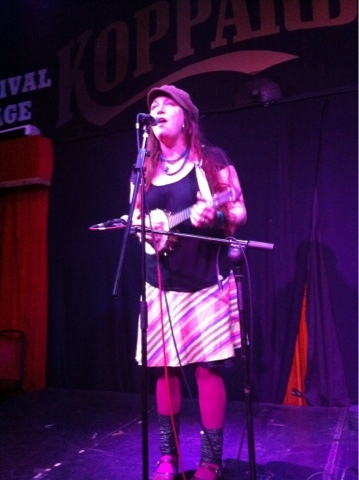 while i couldn't quite afford the 40£ price tag for a talk with good ol' mitch buchanan (or the cost of dignity lost), there were many free acts listed for artists who are seeking publicity, so i didn't waste any time and decided to go see the return act of the tricity ukulele cabaret. i wasn't sure exactly what to expect, but wasn't that pretty much why i was there in the first place? ok, that AND the fact that it was a free event. the show started at 9:30pm, which was the perfect amount of time for me to check into my hostel and rid myself of any "i'm too tired from traveling" excuses. the venue was in a pub that hosted many simultaneous acts in separate rooms, so i also managed to grab a "i need to wind down from travel exhaustion" beer. as a woman in a floor length blue velvet dress with a ukulele headband holding together her up-do approached the mic, i knew i had made a good decision to attend. the tricity ukulele cabaret is one if the repeat acts that hosts five to six artists who request to perform a number on the ukulele. from the audience, three judges are selected and each act receives a 1-5 score based on their performance. the winner from the previous night not only wins the pride if being the best ukuleler (new word? ), but they are also able to return the following night for a one-song performance of the host of a song on the subject of their choosing. 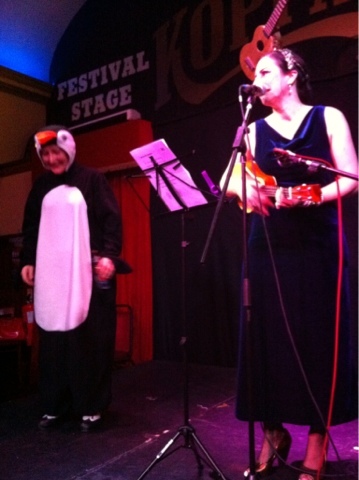 so, the first act of my performance was the winner from the previous night, who apparently requested that the host write a song about a drunk tap dancing penguin. to top things off, the winner was also dressed in a penguin suit and proceeded to tap dance on stage. drunk. so drunk in fact, that as she took an aggressive "first sip" of her beer during her dance, the beer overflowed out of the bottle into her mouth, which caused her to spray the entire front row with a lovely beer and saliva mixture. so basically, just like sea world: "if you are sitting in the front row, you may get wet." the remaining acts were slightly more serious performances, including this amazing hippie woman with glittery leg warmers who sounded almost exactly like norah jones. she kind of cheated and played a banjo AND a ukulele (also glittery of course), but unfortunately she didn't win. despite bringing her "number one fan" to the stage (her 4 year old son), the prize went to some woman who performed a song about how she thought her baby wasn't hers when she had him (her baby is blond, she is asian). clearly not the woman who sang about being asian.